Murder, Now and Then is a detailed looked at how life, love and the world affect the average human being. It’s a book that does not necessarily revolve around the terrible murder that happens but the people it affects both leading up to, during and after the incident. What tugs the reader along is knowing that the title in-and-of-itself tells us that there are two murders – one in the past and one in the present. The problem is, what should have been an open and shut case baffles the constabulary as a series of coincidences and interconnected lives ‘now and then’ come together. 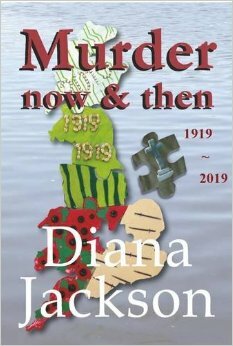 Author Diana Jackson delves deep into the lives of those citizens most connected to the recent (and past) deaths in Haynes, Bedfordshire. Jackson’s passion for social anthropology heavily influences the extensive degree to which she illuminates the lives of those involved in this small town murder mystery that ends up spanning continents. By giving glimpses of various characters lives and layering these episodes alongside the recent past and present of the people caught up in the 1919 and 2019 murders Jackson brings to the fore the town, the citizens’ way of life, and the social legacy which brings bearing on the present and the future. Murder, Now and Then is a thoroughly developed and well-written novel fans of cozy mysteries will love to get lost in. However, for a more action-oriented reader like myself, I found Jackson’s attention to detail beyond my expectation and therefore caused the thrust of the story to lag. Additionally, the jumping back and forth from the various time periods and character perspectives, while integral to the plot, left me reeling slightly and pulled me from the flow of the story. For anyone interested in social history, the inter-workings of small town life and how our past informs the present, the microscope Jackson places on Haynes and its people will delight, astound and surprise you.